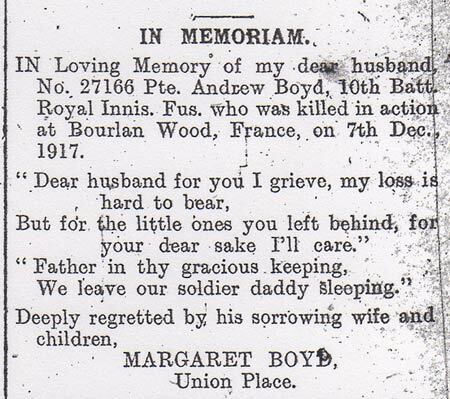 Andrew Boyd was the son of Mrs Margaret Boyd. Andrew was born about 1886 in Seapatrick, County Down. The 1901 census records Andrew as 15 years old. Andrew and the family were living in Ballysaggart, Dungannon. Andrew's mother Margaret Anne was a widow who worked as a Reeler in Spinning Mill. Andrew had left school and was working as a weaver. Mother's Family: Margaret Ann Boyd, Robert Henry Boyd (born about 1883), Minnie Boyd (born about 1884), Maggie Boyd (born about 1889), Andrew Boyd (born about 1886), Hugh Boyd (born about 1892). The 1911 census shows Andrew had married about 1906. Margaret and he had three children. Andrew worked as a painter. Family: Andrew Boyd (born about 1886). Margaret Boyd (born about 1888), Samuel Boyd (born about 1907), Margaret Boyd (born about 1910), Andrew Boyd (born about 1911). Andrew served his apprenticeship as a painter with Mr Nixon of Dungannon. He had worked for him for 16 years. Andrew Boyd enlisted in Omagh, County Tyrone around January 1916. 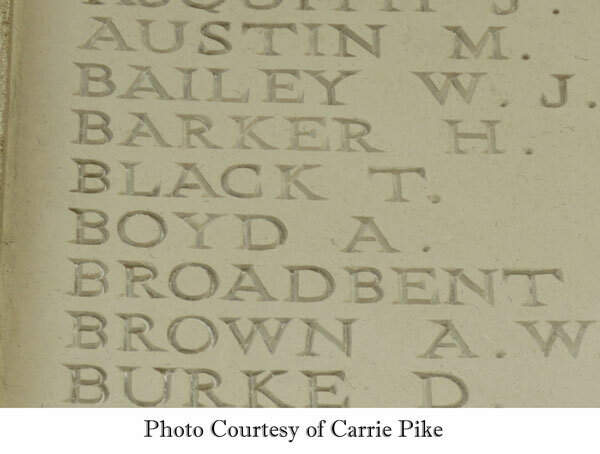 Private Boyd went through the 'push' all right, but the Battalion had to go in to repel a German counter attack and he was killed by a shell in the front line. Private Andrew Boyd, Royal Inniskilling Fusiliers, Union Place, Dungannon, killed in action. He was a member of Dungannon Total Abstinence L.O.L. No. 1229 and of the Dungannon Conservative Flute Band. Mrs Boyd, Union Place, Dungannon, has received official intimation that her husband, Private Andrew Boyd, Royal Inniskilling Fusiliers, was killed in action in France, on the 7th December 1917. 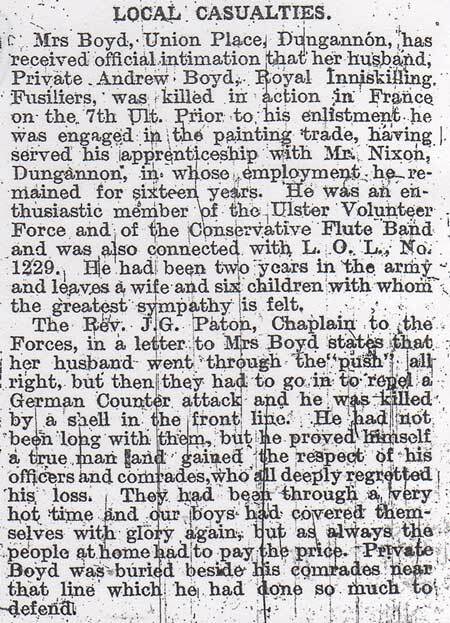 Prior to enlistment, he was engaged in the painting trade, having served his apprenticeship with Mr Nixon, Dungannon, in whose employment he remained for sixteen years. 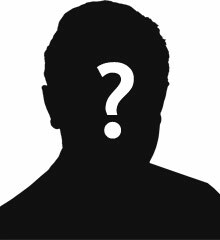 He was an enthusiastic member of the Ulster Volunteer Force and of the Conservative Flute Band and was also connected with L.O.L No 1229. He had been two years in the army and leaves a wife and six children with whom the greatest sympathy is felt. The Rev. J G Paton, Chaplain to the Forces, in a letter to Mrs Boyd states that her husband went through the 'push' all right, but then they had to go in to repel a German counter attack and he was killed by a shell in the front line. He had not been long with them, but he proved himself a true man and gained the respect of his officers and colleagues, who all deeply regretted his loss. They had been through a very hot time and our boys had covered themselves in glory again, but as always the people at home had to pay the price. Private Boyd was buried beside his comrades near that line which he had done so much to defend. Private Boyd was buried beside his comrades near that line. Unfortunately that grave could not be found and he is commemorated on Cambrai Memorial, Louverval, France. The Cambria Memorial photo above has been kindly donated by Bob Pike, courtesy of Carrie Pike, via the Great War Forum. In Loving Memory of my dear husband, No 27166 Private Andrew Boyd, 10th Battalion Royal Inniskilling Fusiliers who was killed in action at Bourlan Wood, France on 7th December 1917. Deeply regretted by his sorrowing wife and children, Margaret Boyd, Union Place. By the time of his death, Margaret and he had six children.